The "Lewis Lamp" as it came to be known in its application in Great Lakes lighthouses actually refers to a combination of two technologies, and is a story of some intrigue. The story began in 1781, when thirty-one year old Swiss physicist and chemist Aimé Argand designed a new type of lamp in which a single wick was able to emit as much light as seven candles. Argand's design featured the incorporation of hollow cylinder within the circular wick, which allowed air to flow both inside and outside the flame at the upper edge of the fuel-soaked wick. The addition of a cylindrical glass chimney created greater draft, promoting steadiness in the flame by preventing side draughts. Argand successfully obtained a patent for this lamp while living in England in 1784, and lamps built to his patent were quickly accepted throughout Europe, becoming the most common illumination in both public buildings and private homes. There is some disagreement as to who was the first to place parabolic reflectors behind Argand's lamp to further boost and concentrate the output. H L. Reynaud, Director of the French Lighthouse Service, credited Aimé Argand himself with the first proposal for an apparatus using an Argand lamp and a reflector. 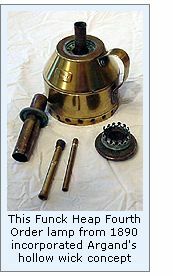 This combination represented a considerable improvement over current illumination systems, and quickly came into widespread use in European lighthouses. 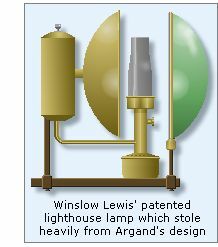 However, the incorporation of Argand's lamp technology with parabolic reflectors in US lighthouses is attributed to Winslow Lewis, and it is here that the story takes an interesting turn. In 1812, Stephen Pleasonton, the Fifth Auditor of the Treasury purchased a patented "reflecting and magnifying lantern" from Winslow Lewis, a former ship Captain. Lewis' reflective optic was made of ten whale oil-burning lamps, each outfitted with a parabolic reflector. In reality, Lewis' "invention" was nothing more than a poorly modified version of the Argand-style lamp. Lewis' lights were also severely flawed, in that their reflectors were more spherical than parabolic, and made of thin copper that warped when exposed to the heat of illumination. Additionally, the silver plating rubbed off easily during cleaning, and the components were so shoddily cobbled together that the assemblies quickly began to fall apart. Finally, the design of the drafting flow was less than optimal, with the entire assembly prone to sooting-up very quickly. Thus the lamps required constant cleaning and adjustment. Despite such problems, Lewis' lamps were quickly adopted by Pleasonton as the de facto standard, and were subsequently installed in all US Lighthouses prior to 1852. It is interesting to note that Pleasonton had previously served at the US patent office, and was working there at the time that Lewis applied for his patent. From his business on State Street in Boston, Captain Winslow Lewis accumulated his wealth as the "Superintendent for lighting the United States light houses," and by the end of 1812, Lewis had received at least $16,000 from the U.S. government in payment for installing his Argand devices in lighthouses. When French scientist Augustin Fresnel installed a lens that produced a light infinitely superior to Lewis' system in 1823, Pleasonton resisted testing the new lens until forced to do so as a result of a Congressional investigation onto the efficiency of lighthouse operations. Evan after the completion of highly successful tests of the Fresnel lens, the lens was not adopted in this country until the administration of aids to navigation was taken out of Pleasonton's hands and assigned to the U.S. Lighthouse Board in 1853. However, Argand's hollow wick system outlived either he or Lewis, as the concept would remain in active use until the perfection of the incandescent oil vapor lamp lamp in the early twentieth century.